All human beings are not equally beautiful. Our skins, colors, and shapes vary from person to person. Besides, we get some dark spots and rough skins when we grow old. And there might be dust in nature when we capture a photo. Consequently, some of us look beautiful, while some others look ugly. But all of us want to look glamorous. This is where we need photo retouching services. In fact, photo retouching is indispensable to be perfect in our photographs. But the frustrating fact is that it is a difficult job to find out the best photo retouching services. Go through the article to avoid any bitter experience while finding out a retouching service. 0.1 What is Photo Retouching? 0.4 Who Needs Professional Photo Retouching Services? Photo retouching is an innovative way of altering a photo to make it perfect. In other words, photo retouching is the way of polishing a photo to prepare it for final presentation. Generally, a retoucher performs some actions related to adjustments to a particular photo. For example, a retoucher has to handle color correction, cropping, and white balance in a specific photo. In addition, a retoucher can turn an old, torn, blur, and stained photograph into a stunning as well as unique photo. To be precise, photo retouching is all about changing a photo to give it a perfect look. We all are inclined to attractive things out there. This inclination is not different in the field of photography. In fact, people tend to see beautiful photos as there is an aversion to flawed photos. But we can hardly find flawless photos. There might be many reasons why we don’t get flawless photos. For instance, we can’t use a quality digital camera most of the time. These photos lose their acceptance and value for lacking attractiveness. And if you want to make your photos attractive, then there is no alternative to retouching. A proper process of photo retouching can make your photos more attractive. Hence, the photos gain wider acceptance and value. Though retouching is a simple word, it has various kinds. Different kinds of photo retouching include portrait retouching, commercial retouching, editorial retouching, beauty retouching, creative retouching and so on. These types of image retouching require a retoucher to perform a bunch of things such as restoration and adjusting, resizing, background cloning and cleaning, color correction, spots, and pimples cleaning. Who Needs Professional Photo Retouching Services? Image Retouching Lab is one of the leading companies in the field of retouching. The company has been providing its services with great customer satisfaction since 2003. They possess a professional website with an outstanding look. The website is full of the necessary information for their potential service takers. You, as a potential service taker of the company, won’t have to undergo troubles to find out your expected information from the website. Image Retouching Lab comes up with a bunch of professional services for its clients. Their main services typically include Image Retouching, Image Masking, Clipping Path, Image Mannequin, Twitch Overlay. You will also find some other services provided by them in the categories of Additional Service and Special Service respectively. But they are widely famous for their photo retouching services since their experts have to deal with retouching most of the time. The portfolio is one of the most significant things to consider while choosing a photo retouching company. It is because a potential customer can come to know about the quality of the service by checking portfolios. For this reason, every professional company across the world has a portfolio. 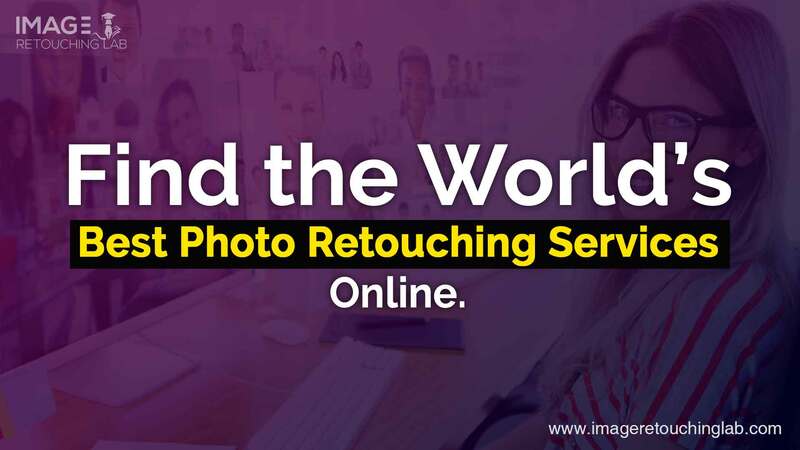 Image Retouching Lab is not different from them. The company has a professional portfolio of their previous works. And their portfolio shows us how professional they are in the field of photo retouching. Compared to their services, their pricing range is satisfactorily reasonable for anyone in the world. They usually charge $0.29 to $20.99 for their different services. And when it comes to image retouching, the price is more reasonable. For instance, they charge $0.49 to $6.99 for their different services in the category of photo retouching. The Photo Retouching is another giant company in the field of image retouching services. According to its website, the company has been working in this field for almost 7 years. They provide reliable services to their clients in the industry. The clients who worked with them in the previous years are fully satisfied with their services. And their clients’ satisfaction proves that they provide their clients with quality services. The company provides 4 kinds of services to their clients. The services include Automotive Photo Retouching, Product Photo Retouching, Clipping Path Services, Fashion Photo Retouching, etc. They offer every ins and outs of image retouching to their clients. You will find details about each service whenever you click on a particular category. Image Retouching has a rich portfolio of their previous works. If you want to check the portfolio before placing an order, you won’t have to undergo hassles. It is because the examples of their previous works will be found under each of their service categories. Besides, the gallery section of their website has a rich collection of the examples which they previously completed. And there is a high possibility that you will fall in love with their example works. The pricing plans of the company are highly reasonable for any business owners around the world. Though they don’t have any specific pricing plans for their services, they don’t charge too high. Generally, their services start from $0.30 per photo. Based on the work, they increase their charges. However, there is nothing to worry about as they are quite flexible about their charges. The company launched its services for the first time in 2010. It is a UK based company working all over the world. Having a pretty long track of experience in this industry, the company is providing its clients with high-quality service. None of their clients found to complain against their services. And they are getting new clients every now and then for their outstanding services. Color Clipping offers a great number of services for its clients. In general, their services are shown under 8 categories on their website. The services, however, include Clipping Path, Background Removal, Image Masking, Shadow Making, Ghost Mannequin, Photo retouching, Image Recoloring, Headshot Retouching, Ecommerce Image Solution, Cropping & Resizing, Photo Restoration, Jewelry Retouching. The website of the company has a rich portfolio of their previous works in the field of photo retouching. All the works included in the portfolio look professional, so there is no chance to be frustrated at their services. To find out the examples of their different services, you will have to check every segment of their services. Color Clipping charges different prices for their different services. In general, they charge their clients from $0.29 to $4.50 for various services. So, we can easily imagine that their pricing is affordable for everyone in the world. However, their photo retouching service is also reasonable. Their charge for photo retouching starts from $1.00. Depending on the work, they increase the charge for their services. Clipping Next is a renowned company in the field of photo retouching. They have a long track of experience in this industry. Established in 2008, the company is trying to reach the pinnacle of their success. They have 65+ designers working hard to serve their clients with great support. Clipping Next is a big company offering various services related to photography. In general, their services include Clipping Path, Color Correction, Ecommerce Editing, Photo Masking, Shadowing Service, Cropping & Resizing, Background Removing, Headshot Retouching, and Photo Retouching. The company has a great portfolio on their website. If you want to have a look at the portfolio, then you have to browse the “Sample” category. A great number of their example works will pop up in front of you as soon as you click on the category. And each of the examples will make you fall in love with the quality. Compared to many other retouching companies, Clipping Next charges a little bit reasonable price for their services. Usually, their charges vary according to the types of work. For example, you have to spend $0.20 to $1.50 per image if you take their service. By the way, the price for taking the retouching service starts from $0.85. So, the price range for the retouching service is highly reasonable. Having 6 years of experience in the field of photo editing, Edit Blocks is one of the dominating companies in the industry. The company is based in Coimbatore, which is a major city in the state of Tamil Nadu in India. Though it is located in India, the company offers different services all over the world. And they provide their services for almost every industry. But photographers get priority to this company. The company offers retouching services for professional photographers to help them get established. Edit Blocks offers a variety of photo editing services such as Image Retouching, Clipping Path, Automobile Image Editing, Photo Masking, HDR Blending, Photo Manipulation, Real Estate Image Editing, 360 Panorama Stitching and so on. However, the company has become successful to gain fame in the field of Image Retouching for their outstanding services. For your kind information, their Image Retouching services include Body Skin Retouching Services, Wedding Photo Retouching Services, Product Photo Retouching Services, and Old Photo Restoration Services. Edit Blocks has a rich portfolio on their professionally designed website. You won’t have to undergo troubles to find out the portfolio as the tab is placed at the top of the homepage. Once you click on the tab, a great number of previously edited photos will pop up in front of you. Consequently, you will have the chance to check out the quality of their service. Though the website of the company is professionally designed, it lacks a tab for pricing. It is a matter of great concern for some people as they cannot know the price of services before taking a service from the company. Fortunately, there are always solutions for the problems we face in our day to day work. For knowing the pricing plans of the company, you can knock them through their sales email. Angel Retouch is another renowned company providing the best photo retouching services around the world. The company has 10 years of experience in its pocket. It has a bunch of photoshop experts to provide its clients with digital retouching services. And the experts are committed to offering the highest possible services in the industry. Angel Retouch offers a wide range of services to its customers. And it has become highly successful to satisfy hundreds of clients from photographers to realtors. Especially, its retouching services for professional photographers have brought the company to the pinnacle of success. The company has a professional portfolio, which is located at the top of the homepage, on its website. The portfolio contains a rich collection of examples of photos edited by the photoshop experts of the company. Try to have a look at the portfolio before placing an order at the company. Angel Retouch offers one of the most affordable photo editing solutions out there. It has three different pricing plans for prospective clients. The pricing plans are as follows: Basic, Standard, and Premium. The Basic plan costs only $0.99 per image, while the Premium plan costs $2.99 per image. And if you decide to choose the Standard plan, then you have to be ready to spend $1.99 per image. Pixel Phant is one of the leading companies in the field of digital photo retouching services. Though the company is new in the industry, it is committed to providing the best services. They have proved their commitment by ensuring clients’ satisfaction. To clarify, thousands of their clients are highly satisfied with their photo editing services. Unlike many other photo editing companies, Pixel Phant does not offer a great number of photo editing services. As a result, they can easily pay their full attention to some particular types of editing. By the way, their photo retouching service contains all kinds of retouching related tasks such as spots, stray hairs, blemishes, stcatches, and acne removal. Pixel Phant, like many other retouching agencies, has a professional portfolio on their website. You will find the portfolio, which is named as Example, of the company at the top of the homepage. And their example photos are impeccable enough to draw your attention. The company offers three different pricing plans for its retouching services. All these pricing plans are reasonable for photographers. The pricing plans, however, include SMFP Photo Editing, High-End Retouching, and High-End Retouching & Makeup. The price range of these plans is typically from $0.50 to $2.50 per image. Pixel Ink Studio is a leading photo editing company, which is located in New York. Although the company is located in the USA, it works globally to help photographers as well as business owners. It is an experienced company, which has been working for almost a decade, in the industry of photo retouching services. The company is solely working in the field of photo retouching. It does not offer any other services to their clients. As a result, it can offer a wide range of retouching services such as Photo Retouching, Fashion Retouching, Product Retouching, Commercial Retouching, Wedding Retouching, Pregnant Retouching, etc. You have to click on the Gallery Tab, which is located at the top of the site, to find out the portfolio of the company. They have listed many photos under this tab to help you decide about their service. The Photoshop enthusiasts of the company have proved their skills at the example photos. Photo Retouching Services of the company cost a client different amounts for different packages. Generally, they offer three packages in the category of photo retouching. The packages are Basic Photo Retouching, Intermediate Photo Retouching, and Advanced Photo Retouching. The Basic Photo Retouching costs a client about $10 and the Advanced Photo Retouching costs about $60. To buy the Intermediate Photo Retouching service, you need to spend about $30. Clipping Panda is a California based photo editing company working in the industry for quite a long time. It is committed to becoming one of the leading photo editing companies in the state. In addition, the company is spreading their services all over the world to help different professionals. Though the company offers a variety of photoshop services, it specializes in retouching. As a result, it can offer poignant services for retouching. However, the photo retouching services of the company include Model Retouch, Beauty Retouch, Product Retouch, and Jewelry Retouch. The company, like many other photo editing companies, has an extraordinary portfolio on their website. To find out the portfolio on the site, you have to click on the Sample tab, which is placed at the top of the site. And whenever you click on the tab, a bunch of photo samples will spring up in front of you. Clipping Panda has nice pricing plans for their clients. Generally, the company costs a client from $1.79 to $6.89 for their retouching services. The charge of their services is fixed for a single photo. It means that you have spend much money if you want a bunch of photos to be retouched. Creative Clipping Path is an emerging image editing company working all over the world. The company is mainly located in Southeast Asia. It is claimed by the company that they have more than 400+ photo experts working in different shifts. For having a large number of photoshop experts, the company can offer almost every kinds of services related to image. Though Creative Clipping Path offers a variety of services, it ensures stunning quality of retouching services. To clarify, the experts of the company are committed to providing the highest possible quality for each retouching service a client takes. By the way, their retouching services include Model Retouching, Product Retouching, Jewelry Retouching, Dust Retouching, and Glamour Retouching. The website of the company does not have any individual category for portfolio, but you can check their previously edited photos on the service pages. This means that you need to click on “Retouching Services” to look into the examples of their retouching works. The pricing plans at the company is highly reasonable. The company usually charges $0.49 to $50 for different kinds of services provided by it. So, there is nothing to worry about your budget while placing an order at Creative Clipping Path. a large number of retouching companies have sprung up all over the world. Unfortunately, many of companies cannot meet the standards of photo retouching. So, it has become highly tough to find out the best photo retouching services online. Our recommendation is that you should, without going to and fro, choose one of the companies discussed above to receive high-quality services in the industry of image retouching. may I want to suggest you few interesting issues or tips. Maybe you could write subsequent articles regarding this article. on-line greater than three hours as of late, yet I never found any interesting article like yours.